In the evenings, a fantastic waterborne Christmas tree of lights shines out to onlookers in the nighttime show “Candlelight Reflections.” The show begins with candles coming alight on the waters of Mediterranean Harbor while Christmas music plays. When Mickey Mouse and his friends appear, lighting numerous candles along the way, it’s time for the tree lighting ceremony to begin. The lights are dimmed and the music fades. In this expectant silence, stardust falls on top of the Christmas tree, making it shine and twinkle with numerous lights. Then, at a signal from the Disney friends, both the Cast Members and the guests come together as one as they raise their ―lights,‖ creating a gorgeous ―sea of lights‖ in Mediterranean Harbor. 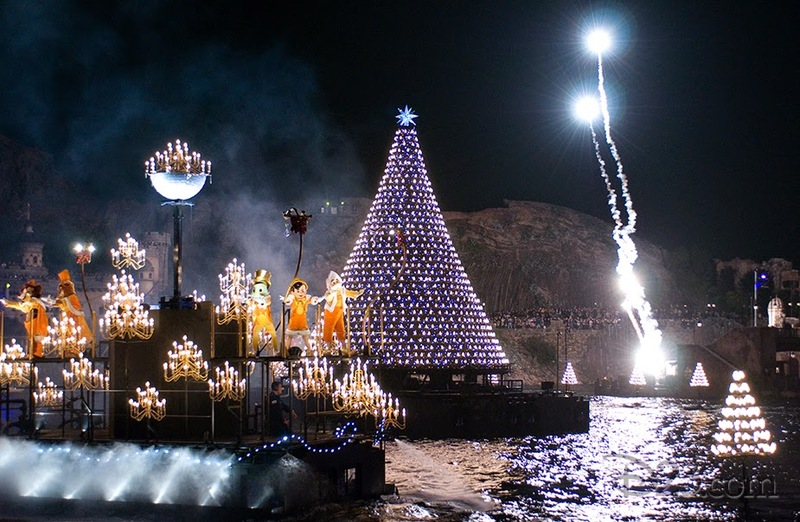 The show comes to a dramatic end with impressive pyrotechnics around the waterborne Christmas tree. (The Christmas tree will remain alight after the show, contributing to the romantic atmosphere at Mediterranean Harbor. ―Candlelight Reflections,‖ performed for 7 years, and was presented for the last time this year (2010). To commemorate this finale, a "sea of lights" was created at Mediterranean Harbor with the numerous lights held by both the Cast Members and the guests. Note: Merchandise for this “sea of lights” will be sold at shops in the Park. In addition, guests who purchase the “After 6 „Pair‟ Passport” will receive a keychain (with glow stick). Guests who visit the Park on November 18 will also receive a complimentary item that glows (limited to one item per guest).